‘Raja sahib’ Virbhadra Singh won for the eighth time in a state Assembly election from Arki, defeating Rattan Singh Pal of the BJP by a margin of 6,051 votes. 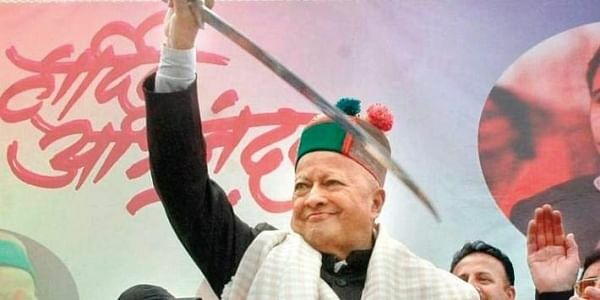 SHIMLA: Victory and defeat came hand-in-hand for Himachal Pradesh's longest serving chief minister Virbhadra Singh who was today ousted from power by the BJP in the state, but marked his own triumph with what may well be his political swansong. The octogenarian ‘Raja sahib’ won for the eighth time in a state Assembly election from Arki, defeating Rattan Singh Pal of the BJP by a margin of 6,051 votes. But his last hurrah will be a memorable one even though he failed to stave off winds of anti-incumbency in a state known to swing between the BJP and Congress every five years. The veteran Congress leader, who hoped to helm the mountainous north Indian state for the seventh term, has had a long political career which began when India’s first Prime Minister Jawaharlal Nehru was still in power. A scion of the Rampur-Bushahr royal family, Singh, 83, marked his political debut after being elected to the Lok Sabha in 1962. He served four more terms in the lower house of Parliament, the last one between 2009 and 2012. He served seven terms in the Assembly from 1983, when he first took the oath of office of the chief minister. Singh ruled the state between 1983 and 1985; 1985 and 1990; 1993 and 1998 and 2003 and 2007. His latest stint began in 2012. Mired by allegations of corruption, yet another shot at office looked improbable for the old war horse this time as the state went to the polls on November 9. Inside the party, the knives were out for him from younger leaders such as state Congress chief Sukhvinder Singh Sukhu. But the fact that Congress could not afford to sideline Singh is a testament to his continuing popularity in the hill state, made up of nearly 50 lakh voters, of whom around 15 per cent are aged between 20 and 29. Many Himachalis believed that Singh was behind the state's growth in fields such as literarcy and health. This time, he was up against a formidable BJP machinery, with none other than Prime Minister Narendra Modi leading the charge against what he called a “zamanati sarkar”, or a government on bail. Modi was alluding to the fact that Singh and his wife Pratibha Singh secured bail on a nearly Rs 10-crore disproportionate assets case that the Central Bureau of Investigation (CBI) began probing in May. The CBI has charged Singh with amassing assets worth around Rs 10 crore, disproportionate to his total income during his tenure as Union minister between 2009 and 2012 during UPA II. Born on June 23, 1934, Singh was educated in Bishop Cotton School at Shimla and St Stephen's College, Delhi. He was 13 when he succeeded to the position of the king of the state in 1947. Singh was the youngest member of the third Lok Sabha when, after joining the Congress in 1961, he won for the first time a year later from the Mahasu constituency, when Himachal Pradesh was a part of Punjab. He again won in 1967 and from Mandi in 1971, in 1980 and then again in 2009. Between 1976 and 1977, Singh was Deputy Minister for Tourism and Civil Aviation at the Centre and Minister of State for Industries between 1980 and 1983. Since May, 2009 until January, 2011, he was the Union Steel Minister and was later shifted to Micro, Small and Medium Enterprises Ministry later. He was sent by the Congress to Himachal in 1983 to replace the then tallest leader, Ram Lal, following allegations of corruption in large scale felling of forests. This time, Singh filed his nomination from the Arki Assembly constituency in Solan district, vacating the Shimla (rural) seat for his son Vikramaditya Singh. Singh also has three daughters. He had contested from Jubbal-Kotkhai in 1983 and 1985, Rohru in 1990, 1993, 1998, 2003 and 2007, and Shimla (rural) in 2012.